Origin and Habitat: Northern Coahuila (Mexico, Northern America). At the time of publication of this species in 1996, it was thought to occur over a range of less than 200 m2, with an estimated population of less than 200 individuals. However, in 2006, the authors discovered a new population some kilometres distant from the original site and estimate the numbers of individuals found there to be many thousands (Lüthy 2007). 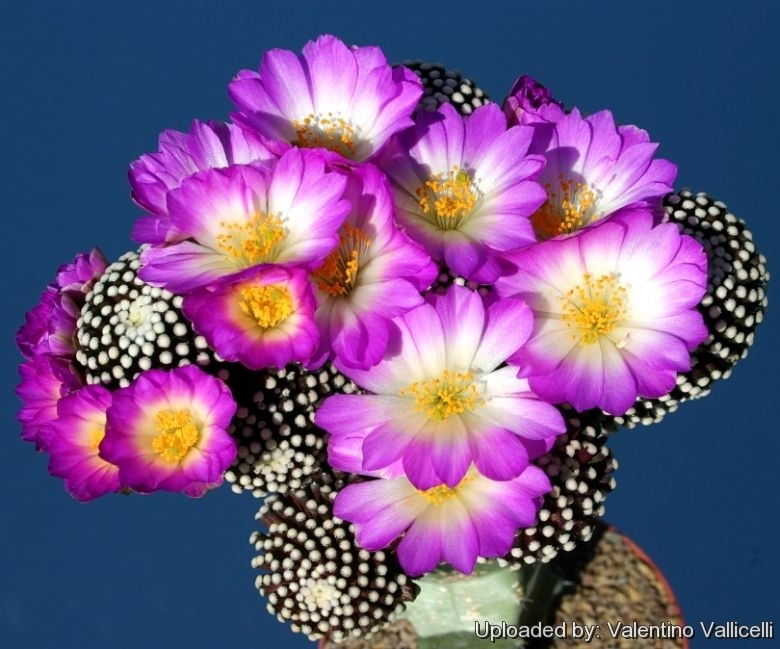 Altitude range: Mammillaria luethyi grows at elevations of around 800 metres above sea level. Habitat and Ecology: This species grows on limestone slabs (rocky terrain) in Chihuahuan semi desert. Lüethy states that upon revisiting the type locality ten years after its discovery, the area showed no sign of having been disturbed (Lüethy 2007). This would suggest that all material in cultivation has resulted from propagation of plants from the original collection. This species is widely and successfully cultivated. If the two locations were publicly known the threat from amateur collectors would be very high leading to the species becoming Critically Endangered or Extinct in a very short period of time. The precise locality is known only to a small number of experts. Despite the readily available populations in commercial cultivation, an intensive search for the localities continues by amateur and commercial collectors. 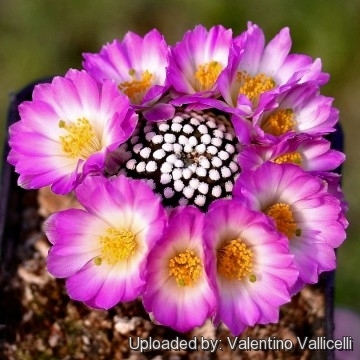 Description: Mammillaria luethyi is a very tiny plant, but by far one of the most spectacular members of its genus, distinctive when not in flower because of the 'spination' (if it can be called that!) at the tips of the tubercles, and even more magnificent in flower. It is solitary or branching in several stems, mostly beneath the ground. 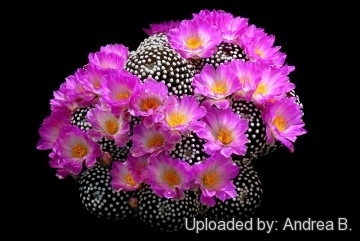 This species is the most sought after cactus by collectors because of its rarity and unusual spines. 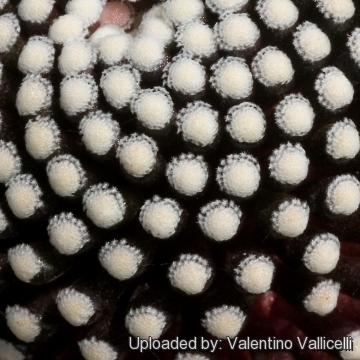 Growth Habits: Solitary or clustering. Stem: 1.5 cm in diameter (Up to 4 cm in cultivation), flattened sub-globose, very dark-green almost black. Tubercle: Dense, erect, slender, cylindrical. The axil is slightly bristly. Roots: Fleshy tap root, largely exceeding the dimension of the tiny stems. Flowers: Large, 15-25 cm wide and long, rich magenta with a white throat. 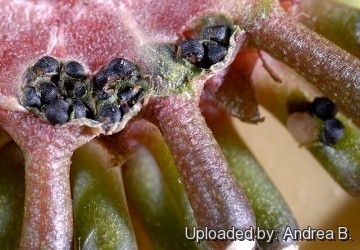 Fruits: 4 to 5 mm in diameter, sunken in the stem, globose, yellow-green to reddish-green. 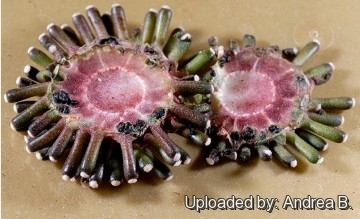 Cryptocarpic fruit: Mammillaria luethyi is one of the few species of cactus with cryptocarpic fruits. That is, the fruit and seeds are produced and retained inside the stem of the plant. After the flower is finished and dropped off, the stem closes over the fruit and the fruit/seed gradually ripens within. The following years the fruit may remain within the body at the axil, or may protrude a bit. A thin membrane will be above the part where ripe seed can emerge. As the plant swells with the new growing season, the membrane fractures, and some seed from the past years can little by little drop down and germinate in the close proximity, forming small colonies. But usually the seeds remain within the plant body for several years or for the whole life cycle of the plant, and frequently they will be released only at the death of the plant after the disintegration of the old stem. several years (Some will sprout unexpectedly after 5 or 8 years!). 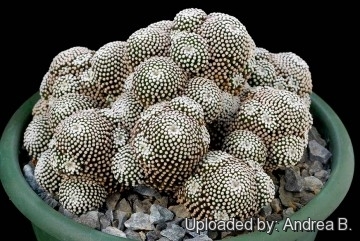 Because of the above peculiarity, seeds and plants of cryptocarpic Mammillarias are seldom available from commercial sources. Seasonal growth and contraction: In the wild these plants contract considerably during the dry season, sometimes pulling down completely under the soil level, and frequently the flowers push up through the dirt from the underground cactus body. In fact, even though these plants show a good amount of new growth each year (at least 1 or 2 cm), they hardly get any larger, and their dimensions remain unvaried year after year, as the individual stems tend to contract at the base. The new growth produced during the vegetative season compacts considerably and retracts sometime, pulling the plant down completely under the soil in the hottest months of summer and coldest months of winter. It should be noted that "when specimens are in this withdrawn state, it becomes almost impossible to find them in their natural state, even though their exact locality is known"
Notes: This plant had long been known from a lone photograph by Boke, published by Bravo & Sanchez Mejorada, of a cultivated plant of unknown origin. It was rediscovered in habitat in 1996 by George Hinton and Jonas Luethy, and published by Hinton in January 1996. 3) Fitz Maurice, W.A., Fitz Maurice, B & Hernández, H.M. 2013. 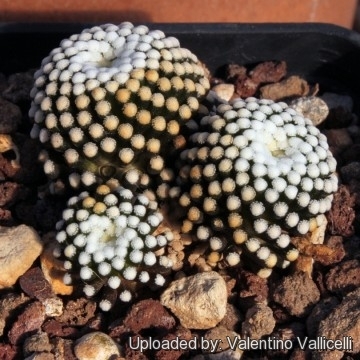 Mammillaria luethyi. The IUCN Red List of Threatened Species. Version 2015.1. <www.iucnredlist.org>. Downloaded on 06 June 2015. Mammillaria luethyi Photo by: Andrea B.
Mammillaria luethyi produces cryptocarpic fruits. That is, the fruit and seeds are produced and retained inside the stem. Photo by: Andrea B.
Cultivation and Propagation: It is a tiny plant of slow growth, for this reason it is often seen grafted to enhance growth speed, as most of the available stock has so far been propagated this way. Grafted plants grow fast, branch profusely and are very floriferous. 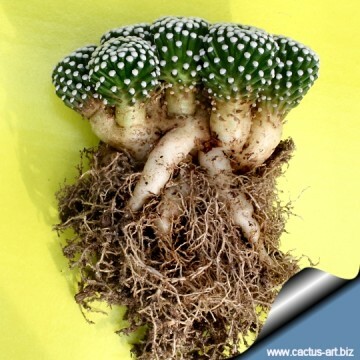 But it is relatively easy to cultivate plants on their own roots and no special care required, at least given the same care with drainage and watering that is afforded to other species of Mammillaria with fleshy roots. Needs good drainage and regular water in summer. It should be dried out completely for its winter rest when it will withstand temperatures down to to -4°C for short periods. The luethyi needs full sun which will help to maintain the lustre of the spines and plants compact. Poorer luminosity levels produce a green anaesthetic plant with open, far and wide spaced areoles. It is prone to mealy bug and red spider mite. Propagation:: Seeds (rarely available) or by offshoot. Older specimens may branch around the base, so they can be propagated by cuttings in spring, cuttings root relatively well but plants on their own roots are quite slow. Plants are sometimes grafted onto column-shaped cacti, which is a much easier way of propagation than sowing.